Deshnok is located 32 kilometers from the south of Bikaner city. There are a number of tourist attractions in Deshnok. 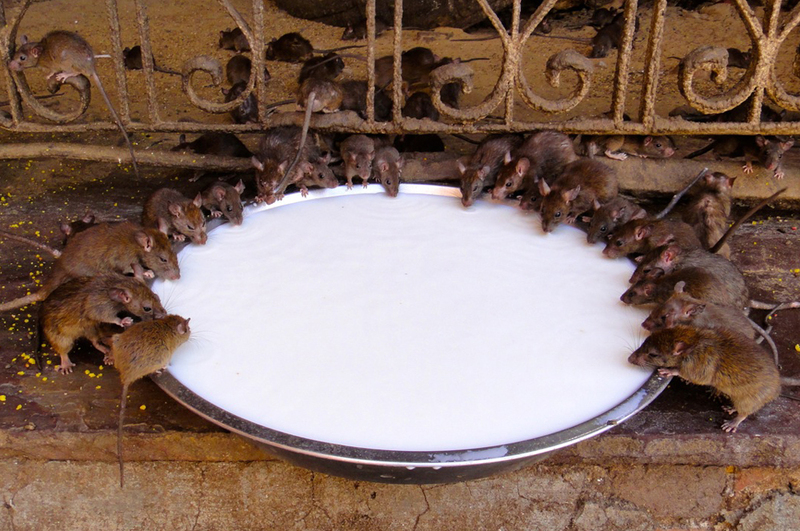 Attractions like Karni Mata temple make it a great tourist place. The visit to the temple is so much popular among tourists as it is one of the oldest monuments in the village. The temple has a high spiritual importance. The temple is visited by a large number of pilgrims from different parts of the country. The temple draws a large number of tourists, especially during the Navaratri. Karni Mata temple : Karni Mata, the 7th daughter of “Mehoji Charan” and “Deval Devi”, was born on October 2nd, 1387 in a village named ‘Suwap’ in Jodhpur region of Rajasthan. The original name of Karni Matha was “Ridhubai”. Ridhubai treated and cured her aunt phenomenally from an enduring disease when she was just 6 years old. Hence, her aunt named her as “Karni” which means an “Amazing woman”. From that time onwards, Ridhubai was known by the name Karni. The word ‘Mata’ means “mother”. Mata is an honor that’s generally offered to old religious women in India. Thus, the name Karni Matha originated. Karni was married at a very young age to “Dipoji Charan” who belonged to Sathika village. Nevertheless, Karni articulated her reluctance to involve herself in marital relationship to her husband. In the beginning, her husband did not pay attention to her decision as he believed that she might change her mind over a period of time. Alternatively, Karni made her husband marry her own sister “Gulab” in order to give her husband a good matrimonial life. Even then, Karni still remained in harmony with her husband for her whole life. With the support of her in-law’s, Karni continued to live in their village for about 2 years. Later, she started to travel with her supporters and a flock of farm animals to survive a peripatetic life by camping at the end of the day. While she was camping at the Jangloo village, an employee of “Rao Kanha”, the emperor of the village, disagreed to give the access to water for Karni’s followers and farm animals. Owing to this incident, Karni Mata affirmed her admirer “Rao Ridmal” of Chandasar as the new monarch of Jangloo village and moved on with her voyage. Later, Karni Mata put an end to her voyage and lived in Deshnok. In the year 1453, Karni offered her blessings to “Rao Jodha” of Jodhpur for winning cities including Merta, Mandor and Ajmer. Around 1457, Karni reached Jodhpur as per the request of Rao Jodha to place the foundation stone at the Jodhpur fort. By Air : It can be reached easily from Bikaner by road. Buses and Taxis are available to reach Deshnok from Bikaner. By Road : It can be reached easily by road from Bikaner which is located at a distance of 30 kms away. By Rail : It is having its own railway station Stand which is well connected by nearby cities of the country via regular trains. 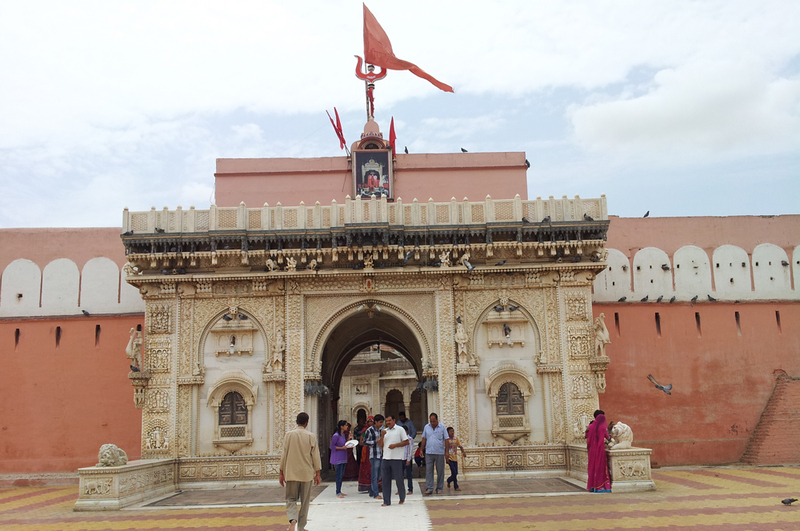 Tourist Attractions Karni Mata temple, etc.